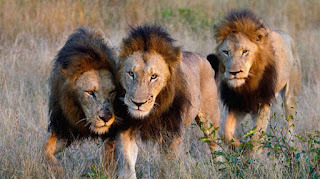 Three lions have saved a 12-year-old Ethiopian girl who was abducted from her home. It is pretty common in Ethiopia that children of any age are kidnapped and donated to men in order to get married. Usually, when this happens, they are beaten and raped so they can accept the idea of getting married more easily. That’s exactly what happened to this little 12-year-old girl. She was forced to leave her parents’ house and was taken to a savannah on the surroundings of her city. When she was there she was abused by her kidnappers and, according to some residents, her parents, the police and the girl’s own testimony, when the 3 lions appeared, the bad guys ran away, leaving the little girl by herself in the savannah. And to everyone’s surprise, the lions surrounded her and stayed there for many hours, until people came to rescue her. Then, the animals went to the woods, leaving the child to be cared for by the people who had just arrived. The case was considered to be a miracle by the inhabitants of the country because these animals are wild and they usually attack people. But, some experts say that a crying child can be mistaken with a lion cub meowing. Whether it is a miracle or not, the truth is that she saw death really close to her and was saved thanks to those wild cats.